(2) in any event, the movements constituting traditional blocks are "too large" for practical use. In many people's minds these criticisms are seen as unassailable. That blocks "don't work" is regarded as a fundamental truth, a basic assumption, unquestionable "fact". The wide acceptance that "blocks don't work" has fuelled 2 very different "answers" to traditional blocks. From the 70s onwards many contact sports schools have substituted boxing evasive movements such as dodging/weaving/bobbing (it was Joe Lewis who is famously quoted as saying "karate techniques from the waist up are a fraud" - he was talking principally about punches, but I've dealt with that to some extent in my article Visible force vs. applied force and I hope to deal specifically with the physics and mechanics of punching in the near future). In the contact sports, if hands are used protectively they are held close to the face as a shield. This was initially advocated with closed fists (a la boxing - see figure 1) until the advent of ungloved fighting in the early 90s (Ultimate Fighting and MMA) when I suspect the reality of having your own fist shoved into your face was revealed as scarcely better than just taking the punch full on (again, more about the boxing vs. karate "guard" another time). Nowadays it is standard practice to hold the palms up against the sides of your head/face instead of your fists (see figure 2). The second "answer" to traditional blocking comes, ironically, from within traditional circles. 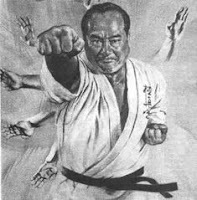 It constitutes an entire school of thought that "there are no blocks in karate", but rather they are a hidden "code" for certain counters, be they strikes (usually to vital points (known as "kyusho" or "dim mak") or grappling moves or both. Clearly the argument that "there is little value in just stopping an attack" is a purely semantic one. It is the proverbial straw man, set up only so that it can easily be knocked down. I don't propose to waste any more time on this "argument". I will continue to use the term "block" in this article to cover "uke" partly for the reasons stated above, partly out of habit and partly because there is no one term that readily comes to mind that would encompass the concept of "uke" ("deflection" comes closer I suppose, but never mind). Now for that old chestnut - "traditional blocks use movements that are too large to be applied against real attacks". For future reference, by "hiki uke" I'm talking about the circular open-handed goju block known by some as "kake uke" - see the series of pictures comprising figure 3. However my demonstration was far from persuasive. The boxer's reply was "well that isn't the same as the block you showed me before, so I've just made my point...". Presumably he was objecting to the fact that I had "cheated" by using only a small part of the hiki uke to deflect his attack - not the full basic. He walked away, triumphant and all I could do was shake my head. "It's all about the basics, stupid"
When people say that "blocks don't work" they are usually referring to basic techniques that were never intended to be applied literally. They are formal movements designed to groove movement along a certain plane/angle optimum to effect deflections or interceptions. Accordingly blocks are a training method: a magnification of much smaller, subtler techniques. By magnifying a movement you can better learn about, understand and appreciate its function. Then you apply it - usually in a greatly abbreviated, or partial form. How did that boxer suppose I developed my ability to deflect his jab - by practising funny little jabbing motions approximating my actual defence? No - the basic hiki uke has, for many years now, served me very well as a practical training tool. Thanks to the basic hiki uke I'm left with a skill which is all but absent in those who do not practice this technique. As an instructor I have tried to shortcut this method by cutting straight to 2 person application, with disastrous results. In my experience you need to learn the basic first before you apply it. In this respect I return to one of my favourite analogies: saying blocks don't work "because no one does it like that in the street" is about as meaningful as criticising speedball training "because no one punches like that in the street". It's just another straw man. However, note that I emphasised the word partial above. I did this because this feeds directly into another point concerning the young boxer. I had used only the top part of the "hiki uke" circle in my deflection. For another attack I might have used the first part of the movement, for another the "supporting" or "secondary" hand. For the purposes of the latter, you should be aware that every basic block contains 2 movements - the primary block (a larger movement) and a secondary block (a smaller movement) in the "pullback" arm (what some people call the "crossing hand"). I am astounded as to how few karateka today are actually aware of this fact. The 2 blocks are intended to be used in concert (in transferring, trapping etc.). Alternatively the secondary block can be seen as a kind of backup if the primary one fails. Furthermore, what I have termed the "secondary" block could actually be used as the principal deflection - while the primary "block" is used offensively etc. This article has focused on the use of the primary block only, and deliberately so: My focus here is to deal with the issue of the general principle of deflection. 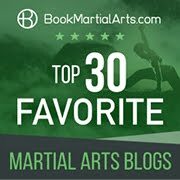 I have dealt with the issue of primary and secondary blocks and their use/relationship in a separate, detailed article (see Two for the price of one: more about karate "blocks"). For the time being, some of this principle is demonstrated in the general video about goju-ryu blocking below at about 1:43 to 2:09. In other words, the basic block isn't "just" a tool for grooving angles of deflection. It is a "complex" movement or, put another way, a collection of related movements any part of which is capable of being applied. A senior practitioner gets the same feeling executing a small movement as a beginner might executing the basic, "large" movement. Hence the senior practitioner may regard the small movement applied in combat and large movements used in the traditional block as one and the same - part of the same continuum, if you like. It is for this reason that I didn't come up with an immediate reply to the boxer: the continuum was, to me, self-evident. It was so self-evident that I hadn't consciously thought about it enough to put it into words. My central point about blocks is: why wouldn't you use them? It is abundantly clear to me that one's arms (and legs) are one's first line of defence - they can intercept, deflect, check parry etc., especially when they are used with evasion (see Evasion vs. blocking with evasion). They can intercept the attack before it reaches full speed. They can set you up for a striking counter or a grappling manoeuvre. Why in Heaven's name would you abandon your first line of defence? Why would you rely solely on evasion when you can use blocks and evasion simultaneously? Why would you allow your opponent's attacks to reach full speed before trying to evade them? In what sense is it better to become a moving target rather than an intercepting missile? And in this case why can't you be both? The current "preferred defence" in contact competition is the "shield" I referred to earlier (as used in MMA - see figure 2). You hold your hands on head and let them be punched rather than your face. I'm not going to disagree with this technique. It has its place. Sometimes you just can't intercept a blow, so you have to wear it the best you can. But this technique is no substitute for proper blocks. So why don't more martial artists apply blocks in fighting/sparring? Modern sports history plays a big role. In gloved sports it is simply not possible to block: the gloves radically alter the nature of your options in both attack and defence. Traditional blocks are designed to be used in bare-knuckle fighting. When you put 2 big pillows on the end of each fist it can cramp your "blocking style", to say the least. Those who have moved to ungloved fighting (eg. 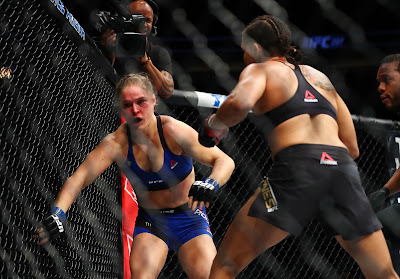 MMA) have predominantly done so from 2 disciplines that do not practice blocks in their traditional guise: boxing/kickboxing on one hand, and ground fighting or grappling on the other. Despite their roots in traditional forms, kickboxers (a la the greats: Benny "The Jet" Urquidez, Bill Wallace and Joe Lewis) abandoned them at the first instance because they had no role in gloved contests. BJJ practitioners might use checks/deflections of a kind in their vale tudo, but these are rudimentary and incidental to their primary technqiues: they rightly focus on their strengths, which are grappling techniques. Traditional martial artists "going along for the ride"
But you'll no doubt comment that many traditional martial "stand-up" artists have "gone along for the ride" in dropping blocks from their curriculum. If they do practise them, they regard them with a curious, quaint affection - like the Model T Ford you might have parked in your garage next to your Mazda MX5. For these martial artists it is getting increasingly harder to justify retaining traditional blocks. They might bring them out at the start of the class for "air practice", only to put them in the garage once the "real" action starts (ie. the sparring). They certainly don't think of their blocks as an essential, or even useful, addition to their armoury. The "running costs" are disproportionate to their "sentimental" value. As a result it's sad to say, but most kung-fu, karate and taekwondo I see in competition looks like a generic form of "faux boxing". Different stand-up traditional martial arts (never mind different styles of the same art) become indistinguishable once they square off on the competition mat/ring. 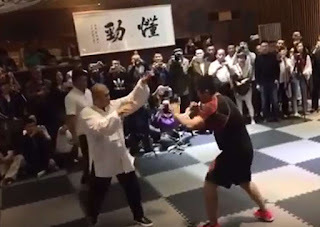 I was first struck by this more than 20 years ago when my instructor and I were watching an "all styles" contest and he lamented that one should be able, at a glance, to distinguish a kung-fu, karate or taekwondo practitioner in a contest. This is however rarely the case - right down to the "Ali" style skipping which arguably has no place in traditional Asian martial arts disciplines (more about "skipping" another time). Historically there is also a lot of glamour associated with Western boxing: people want to "float like a butterfly and sting like a bee" just as Ali did. 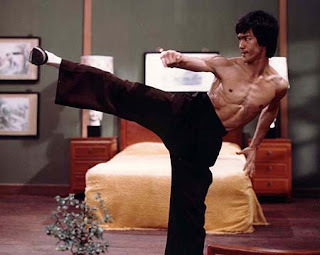 They want to emulate Bruce Lee's eclectic, boxing-influenced fluidity. 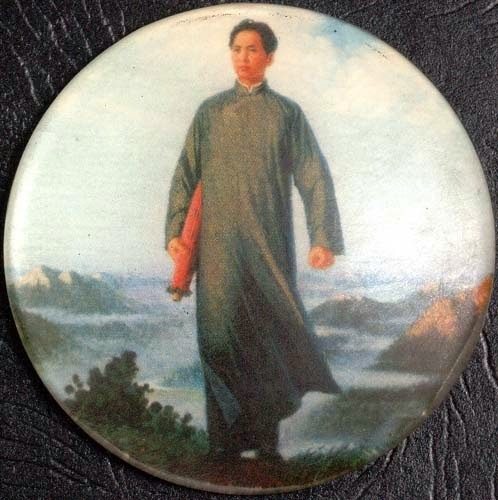 Traditional martial arts might have been respected (at least at some point), but not being sport-focussed they offered few role models for the mat/ring which is "where the action is". It is my view that the rapid spread of arts such as karate throughout the world has also resulted in a great deal of dilution in understanding of traditional techniques. Some of this dilution might have occurred even earlier (eg. 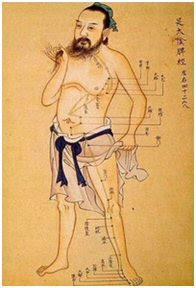 in the case of karate, in its transmission from China to Okinawa - see my article Karate and the Chinese arts: Part 1 and Part 2). Put simply, many martial artists today don't use blocks in sparring/fighting because they haven't acquired the necessary skill obtained by practising them either sufficiently or correctly. In respect of the latter it is crucial to note that traditional blocks won't work if some part of the movement is incorrect or missing. Often I see the macro movement of traditional blocks is there, but the detail has long vanished or been misunderstood/reinterpreted. 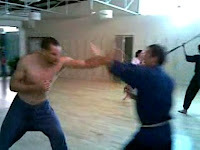 The series of pictures comprising figure 5 shows a typical "chudan uke" from karate as performed (incorrectly in my view) by many modern karate and taekwondo practitioners. This version relies on the assumption that the block must move sideways and then come back in. It relies on forcefully "smashing" your opponent's attack out of the way. The forearm is fixed (ie. it doesn't rotate) and the sideways "smash" is completely linear, catching the attack with the thin (weak) edge of your forearm. The answer was, of course, very simple (although I couldn't articulate it immediately as a young teacher - I realised when I got home, but the beginner never came back for a second lesson...). The series of pictures comprising figure 7 shows the shorin-ryu chudan uke (as found, say, in naihanchi shodan). This block also relies on a circle to deflect the attack, however the circle being utilised is not inscribed by the forearm moving at 45º to the body: rather the circular action creating the deflection is in the twisting forearm. Once again the flat edge of your forearm is the first to contact your opponent's attack. This block is particularly useful when the forearm is already to the opposite side of the body (possibly from some other technique). You certainly wouldn't deliberately throw your arm out to the side (thereby creating an opening for your opponent) just to create some momentum for your block. 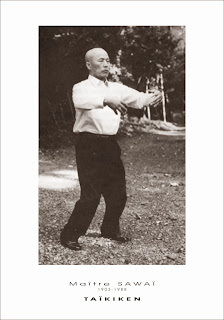 Again, you might go out to meet the attack, in which case the technique is known as mae ude hineri uke - as found after the punch in the opening 3 moves of sanchin/sanseru/seisan/suparinpei. In both cases the block does not rely on brute force. There is also very little impact - contrary to the "smashing" (meeting force with force) approach taken in the misguided figure 5 "technique". Rather the circle causes the attack to "slide" past and puts you in an advantageous position. Of course the 2 types of basic chudan uke can be combined: you can use a 45º angle circle together with a twisting forearm circle to generate an even more efficient deflection. This is seen in many of the kata - eg. seipai. An analysis of the basic age uke or "rising block"
I agree that many "blocks" in kata have other meanings/uses/applications. However I think this interpretation has been highly overstated in recent years (as part and parcel of the greater drive towards finding "hidden" or "secret" bunkai - a whole "industry" seems to thrive on this stuff). Most blocks are, in my view intended primarily to assist avoiding being hit (while creating a set-up). To paraphrase Freud, "sometimes a block is just a block". What misleads some people is the fact that basic blocks (including those in some kata like gekisai) appear to be "large" or "impractical" movements. However this thought process involves a fundamental misunderstanding: basic blocks are training tools that contain the complete plane of deflection for a particular angle. When you apply the block you might only effect part of the basic movement. Basic blocks should not be applied literally. I doubt I could execute a full classical hiki uke against a jab, or probably any basic block against a realistic attack. However basic blocks are necessary tools to gaining the ability to execute smaller deflections with the same internal "feel". Remember that at its most basic level a block is just an interception of a blow using your hand, forearm, upper arm, foot, shin or thigh. A punch screaming towards your head might well be intercepted by your hand more efficiently than bobbing your head out of the way, particularly if your hand is already in a "guard" position and only has to move 10cm or so to effect a wedge or other deflection. 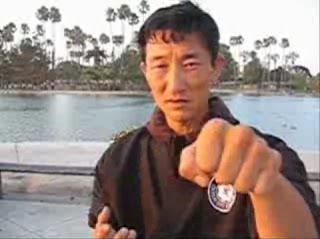 Generally blocks are also backed up by "taisabaki/tenshin" or body evasion so that you do not rely on blocks alone (see my articles Taisabaki and tenshin - evasion in karate: Part 1 and Part 2 and Evasion vs. blocking with evasion). In our school we most definitely use blocks as part of our arsenal - and, I believe, very effectively too. And yes, in some circumstances blocks in kata may represent more than just the block: they might disguise locks or holds or represent pressure techniques etc. But to say that kata do not have blocks at all is, in my view, an unnecessary revision of traditional forms that unquestioningly accepts the myth that "blocks don't work". In my experience it is self-evident that they do! If we apply this principle (every kihon block is composed of two blocks and a pullback), your bunkai also changes a lot. Even gekisai dai ichi, the most basic goju ryu kata becomes pretty advanced. However, I am not sure about the secondary being the a backup block. First of all, I think that for primary block you refer to the visible, or more recognizable block, which usually gives the name to the block. The secondary block is a less visible block of which many people is unaware. For instance, in the uchi uke you talk about in your videos, the secondary block is first, and the primary is last. Same in yodan age uke. In gedan barai uke, when the arm of the primary block is in front of the face, the other arm is performing the secondary block as gedan. So if the secondary block is first, it can not be a backup block. But, if the secondary block is first, it means the secondary block is the first defense, and the more visible block (or primary) is the counter or the setup for the counter. For example, first movement in gekisai dai ichi: someone punches you, so you use the secondary block to deflect and primary block to strike. Are we using the same primary-secondary block concepts? As discussed elsewhere Alfredo, I have used the term "backup" very loosely and, to some extent, inaccurately. Suffice it to say that the "backup" could actually be the "primary" block - indeed this is often my brother's preferred method of applying blocks from karate. I propose to expand on this fascinating issue another time. 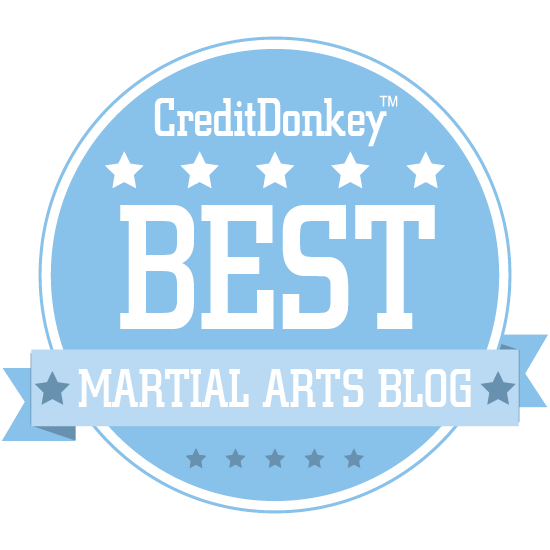 For now, this article must serve as a mere introduction to "blocking" in karate. I liked the analysis you gave. I find it interesting that I have never heard anyone make the statement that traditional blocks don't work before. Then again, I tend to ignore a lot of the statements I hear against traditional martial arts anyway. In order to show that the blocks work, they need to be pressure tested against people outside of the system. While I think it's great you spar, you can't claim something is effective unless it works against people who were trained differently. 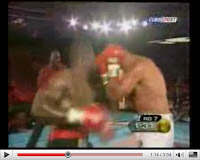 I don't have much sparring footage, and that which I have is not hard contact. I shall have to film something to demonstrate that the inherent mechanics of our hard sparring are not really different as regards use of deflections (blocks). When knives or other weapons are involved you have to adopt a different strategy. I use the Filipino martial arts approach of stopping the shoulder with one hand and the forearm with the other and not attempting to grab on the first contact (especially with a knife). I'll detail this in a video sometime. Brilliant post. Love reading about this kind of stuff in such a thoughtful way. I studied a fusion of goju (U.S. style) and Hapkido for years, then switched over to Brazilian capoeira (just for the fun of it), which has virtually no blocks and relies heavily on training in full-body evasion (BTW, I could not locate your "evasion" post). Thank you for these excellent articles. One of the most common mistakes made when using physics in evaluating the effectiveness of striking techniques, or when simply discussing what’s necessary to achieve effective strikes, is to confuse momentum with energy. In short, we should not be concerned with momentum; one way to define momentum is, the amount of force necessary to stop a moving object. But stopping a moving object is not what we’re after – and neither is the force necessary to stop it. What we want is to apply a destructive force to the target we are moving against. Now – the formula for momentum is m X v, where m = mass and v = velocity. So, if we’re going to work off of that formula, then in order to develop a more effective strike we can either increase the mass that we’re moving (grab a fistful of quarters), or increase the speed of our strike; either one will do. But momentum is not what we’re concerned with when we’re working with karate strikes. What we want is energy transfer – we want to transfer the kinetic energy of our moving hand or foot to the body of the opponent. The formula for kinetic energy is ½ m x v squared. Ooh, look at that magic "squared” Along with that magic “½,” that changes everything. Let’s imagine that your fist is comprised of 10 units of mass, and you’re moving it with 10 units of velocity. Now, plug those numbers into the formula for energy, then begin doubling first the quantity of “m” and then doubling the quantity of “v,” and see which of those doublings will transfer more energy to the target. As things stand originally, ½ the mass (5 units) times the square of the velocity (100) will get you 500 units of energy. Doubling the mass will get you 10 X 100, or 1000 units of energy. Leaving the mass as it is and doubling the energy will get you 5 X 400, or 2,000 units of energy. Velocity is clearly the king when we want more effectiveness from our strikes. It’s like this: Say that a 100-ton locomotive, moving at ½ mile per hour, was to collide with your person. That’s an enormous amount of momentum, but it’s hardly likely to cause you any injury – the most it will do is push you to the side. But now let’s consider a 100 grain bullet, moving at ½ mile per second. It’s that bullet -- and the velocity at which it's moving, that’s going to do you in. Another reality of physics is that a striking object that bounces off its target transfers more energy than a striking object that does not bounce off – but that’s a discussion for another day. It is worth considering, though, when fine-tuning our punching technique. Great site -- very interesting and thought-provoking. Glad I found it. Thanks Jack for your insightful comments. And a belated thank you to Patch. The principal evasion post can be found here.